The Dewalt DC300K Heavy-Duty 36-Volt Cordless 7.25-inch Circular Saw Kit raises the bar on runtime and cut speeds for circular saws -- both corded and cordless. Engineered with a revolutionary 36-volt battery, the DC300K provides professional users with increased levels of power, runtime, and battery life, while maintaining a similar weight to corded and other 18-volt circular saws. This saw gives professional contractors the power and performance of a corded tool with the flexibility of a cordless saw. The DC300K features a full-sized 7.25-inch blade and a powerful motor. See it in detail. Revolutionary 36-volt battery technology means more power, more speed, and longer runtimes for whatever cutting application you need. The DC300K delivers twice the cutting performance of Dewalt's 18-volt model. View more performance comparisons. 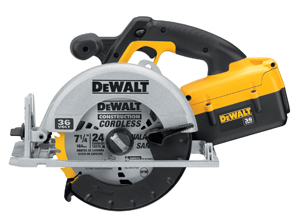 Dewalt designed the DC300K with a full-sized 7.25-inch blade. This feature provides you with an increased cutting capacity at 90-degrees and 45-degrees, when compared to other cordless 5.375- or 6.5-inch circular saws. The DC300K is also equipped with a patent-pending all-metal keyless blade clamp for quick and easy blade changes. For increased durability, the circular saw has a high-strength magnesium shoe and upper guard. Engineered with a 50-degree bevel capacity, with lever action detents at 22.5- and 45-degrees, Dewalt has added yet another productivity enhancing feature to its line of circular saws. This design allows for aggressive bevel cuts, while enabling you to locate common angles quickly. For even greater comfort and control, the DC300K has an anti-slip comfort grip. When compared to the industry's leading corded and cordless circular saws, the DC300K cuts faster and longer than the competition. When tested against other corded circular saws using eight feet of 0.5-inch OSB, the DC300K was able to cut through the material in 5.14 seconds -- that's 20-percent faster than the Makita 5007 and the Skil HD77 corded circular saws. 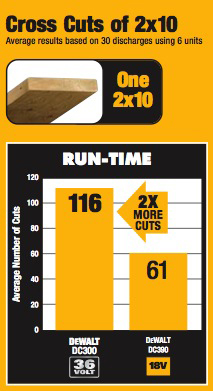 When testing the runtime of the tool, the DC300K cut an average of 224 feet of 0.5-inch OSB and averaged 116 cross cuts of 2x10-inch boards -- two times the amount of the industry's leading 18-volt saws. 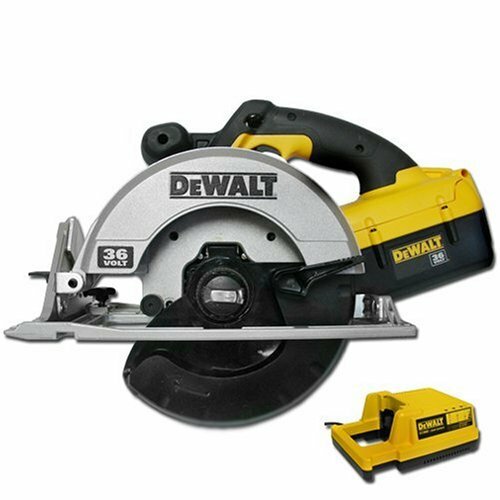 This circular saw is designed with a high-power, Dewalt-built motor with an electric brake, which is powerful enough to complete the toughest applications. The DC300K is ideal for trim carpenters, electricians, plumbers and HVAC professionals, as well as for remodeling and framing jobs. Combined with double the runtime of a standard 18-volt saw, the DC300K is sure to bring to new levels of productivity to any jobsite. 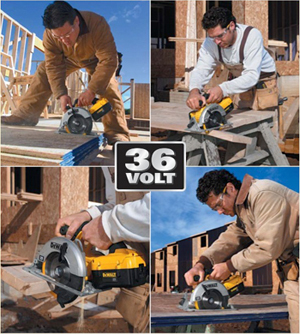 The 36-volt cordless battery platform was developed to provide professional contractors with the performance needed to complete high-powered applications that were previously only possible with corded tools. By partnering with A123 Systems -- a developer of a new generation of lithium-ion batteries developed at and exclusively licensed from the Massachusetts Institute of Technology (MIT) -- Dewalt's 36V line of tools are equipped with a unique Nano-Phosphate lithium-ion design. These revolutionary batteries offers a high level of power, long run-time and durability when compared to conventional lithium technology. In fact, this technology delivers a battery with a maximum life of over 2,000 recharges and no frustrating battery memory. With this breakthrough innovation, this 36-volt tool is sure to live up to Dewalt's commitment to providing Guaranteed Tough products for the professional end user. Note: Do not try to discharge the battery beyond the point where the tool no longer performs with the power needed for the job. This may cause permanent damage and prevent the battery from taking a full charge in the future. Do not tape the trigger on the tool to discharge the battery. Dewalt DC300K cordless circular saw, one 36-volt battery pack, one-hour charger, 7.25-inch carbide tipped blade, rip fence, and a heavy-duty kit box. It doesn't really matter what you need to do, this saw can do it. My team and I were recently building in Africa, where 120v power is not available (local power is 220v). The only power tools I brought were 18v and 36v DeWalt equipment. The 36v circular saw was a jobsite favorite. We did buy a 220v corded saw in-country, and no one would use it. They all preferred the 36v for balance and power. As for battery life, it was extremely impressive. We set up a cut station, and had 5 carpenters calling out cuts. Our cut man kept up with all 5 carpenters and our helpers, and was able to get through the day on 2 batteries. We built 1400 sqft of stick-frame school in 5 days, and this was the only saw we needed. I can't say enough good about this saw. The only thing I've found it couldn't do (even with a new blade)was rip a ridge vent through 1/2" OSB, roofing felt and asphalt shingles. It just ate batteries too fast. Then again, a side-winder saw didn't do well at that either, so I can't ding this saw. It won't replace my worm-drive for roof framing, but it's about the only saw I use now when I need a side-winder. The only thing it needs is a framing hook! The blade guard sticks closed when trying to cut. Part of it is do to the blade guard and a little plastic nub at the top. The other part is the blade guard is plastic and bends when forced against wood. When that happens the guard simply binds in place and you can't move the saw forward. If the saw bevel is set to 45 degrees or more the blade guard nub gets in the way and you can't cut. One battery comes with the saw. It might last for the average homeowner doing a little work, but for someone who is building decks or fences or something a little more intensive, one battery is not enough. I also have a 36 volt drill from DeWalt which came with two batteries which helps. The safety button that you have to push down to operate the saw seems flimsy. My only problem as you see is the blade guard. The guard should have been made out of metal like every other circular saw that I know of. The pluses are that it is lightweight, durable, no cords to cut, powerful, and easy to change blade. This Dewalt 36-volt 7-1/4 cordless circular saw works great. At first I was somewhat skeptical of how much power this saw would really have, and it has not let me down. This saw has plenty of power and is very easy to use. I used it over the weekend to cut through oak for some cabinet work, and it cuts like butter and seems lighter in weight than I had imagined. Mine came in a combo kit with the light, hammer drill, and reciprocating saw. I would definitely recommend this saw to others. Another great tool from Dewalt. This saw would get five starts if it had a rafter hook. To me, the biggest advantage of this saw is you can take it up on the roof and not worry about dragging a cord through trusses, but the problem is where to put it when you are framing a roof. If it had a rafter hook, it would be much more convienient. Other than that, it has good power, not near as much as a worm drive though, it will get bogged down trying to rip lumber or cuttig a bevel, but has much more torque than the 18v saws. One battery will last about a half day, so 2 batteries will usually get you through the day. I would recomend this saw to a framing crew, it is suprising how much you will use it once you get it out. Everyone usually goes for this saw first, because of the convienience of it. I think it is defintely worth the investment. Just get 2 batteries. I have always wanted a good cordless tools but I did not believe cordless had it. I started with the 7 1/4 in Dewalt saw and wow! do I believe now.I am going cordless all around. SO MUCH BETTER THAN THOSE WIMPY SAWS OF YESTERYEAR. IF I DIDN'T KNOW THAT IT WAS BATTERY OPERATED, I WOULD HAVE THOUGHT THAT IT WAS "PLUGGED IN". I ALSO HAVE A 36 VOLT DRILL THAT USES THE SAME BATTERY. BETWEEN TWO BATTERIES AND A ONE HOUR CHARGE TIME ---- WHO COULD ASK FOR MORE? This is a great saw. After using other cordless saws (Makita,Rigid,Bosch) this saw is way better. The 36v battery lasts pretty long (As with any cordless saw, the thicker the material, the shorter the battery will last). With the 36v battery as well, you have power to the end. It doesn't fade and get slower. For cutting sheathing, it rocks. I resheathed many roofs with it and on more than one occasion using just one battery. When it comes to cutting 2x material, it works pretty good. If you're making an angle cut with a beveled cut though (for example when building a hip roof), it will do the job, but you need a bit of patience. With a new blade it works a bit better. But unless you're using a worm drive saw, its pretty normal for a circular saw. A great thing about this saw to is that it has a 7 1/4 inch blade. Most cordless saws have 6 1/2 and if you need to buy a new blade, you don't have a lot of choice and not every store carries it. But this saw had a "normal" size blade which means that you have much more selection and pretty much every hardware store carries them. I have a Bosch framing blade on mine at works great. Also when changing the blade you don't need a wrench or an Allen key to get it off. You push out a little thing and unscrew it. Very easy to change the blades. This winter I helped my brother in-law build his house in Northern Quebec in December. This saw did everything. And that week it was -25 C almost everyday. The saw just kept on working. Combined with the Dewalt 36v reciprocating saw, you could accomplish most tasks with ease. My suggestion though is that if you know you are going to use it a lot, get another battery. The Dewalt 36v batteries are a little expensive, but well worth it.